Miss Berry asks Mr. Cockrill to check on the taxes for the lots down in Druid Hills. 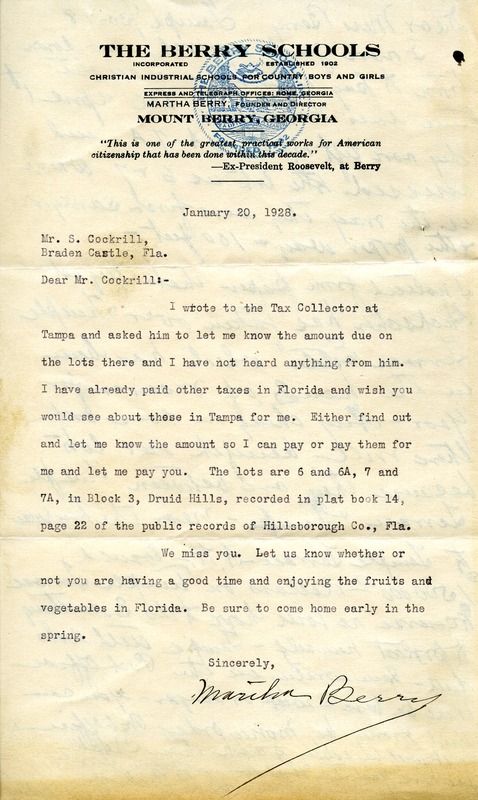 Miss Martha Berry, “Letter to Mr. S. Cockrill from Martha Berry.” Martha Berry Digital Archive. Eds. Schlitz, Stephanie A., Meg Ratliff, Rachel Renaud, et al. Mount Berry: Berry College, 2012. accessed April 20, 2019, https://mbda.berry.edu/items/show/7027.